Our Bothell Kayak Bothell location is located at 9919 NE 180th St at Bothell Landing (map below). There is ample parking at this location, you can follow the signs. This location is great for larger groups. 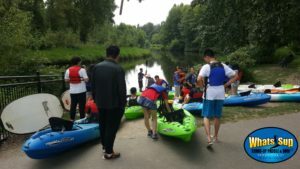 Looking for a place to eat before or after your Bothell Kayak adventure? Our Bothell Landing location is close to Bothell’s Historic Main Street which has some great places to eat. Gallo De Oro Mexican, Brew Coffee House, Pen Thai (one of our favorites), Three Lions Pub and Alexa’s Cafe. Lots of free parking at the paved lot, East gravel lot or City Hall across the street. Restroom, Play ground, BBQ and picnic tables make this a great area! Right across the street from Downtown Bothell with many restaurants and pubs.